My New Year’s resolution is to keep content on this site updated regularly – aim is to cover off one raga a month at least. I start off with Khamaj. Khamaj is a huge repository of very melodious and sweet tunes – so sweet sometimes, it’s unbearable !. Key ragas of this camp include Khamaj itself, the beautiful raag Des (or Desh), Tilak Kamod and Jhinjhoti. Variants include Jaijaywanti, Gorakh Kalyan and the like. Even Kalawati is technically in the Khamaj camp.Khamaj dominates semi classical and Bollywood songs as well. I start off with a tribute to one of the greatest leaders of mankind : Mahatma Gandhi, whose death anniversary was marked this week – and whose favourite song was the Bhajan “Vaishnav Jan To” composed by 15th Century Poet Narsinh Mehta, set to Khamaj. Here’s a rendition of this classic (first stanza only) on my sarod, with a bit of Desh tacked on to the end. As always, this is a one-take affair, no computer skullduggery to hide the rough spots, recorded on the Zoom in my music room. It pains me to note the sordid and utterly biased criticisms leveled on Amjad Ali Khan while trying to highlight the distasteful sarod playing by the likes of the Maihar protegees…namely Ali Akbar Khan. However your defense of the Amjad brightens my spirit knowing there is hope enough. Ironically I had commenced listening to Amjad only after being initiated by Ali Akbar. To his credit it maybe maintained that Ali Akbar in his leisurely and unhurried alaaps is tolerable and the aficionados praise his saccharine sweet sound production which maybe interesting in spurts and sparks but wears out over continued listenings. Amjads sound production is all encompassing, bold, modern and extremely logical and coherent and what is music if the artist isnt Tayyar and technically sound. The sarod isnt meant to be dripping honey like perhaps the sitar…its sound should facilitate all tangible emotions and be assertive and diferent. This is the trouble with the discerning audience of India. They outright dismiss Amjad as they consider not sweet enough which is a pathetic logic if i may say so. Please send me an email on my id so that I may send across to you a research paper i have authored where i have staunchly defended Amjad Ali Khan. Thanks for your note. Ud Amjad Ali needs no defence – his track record and popularity speak for themselves. Most of these internet critics couldn’t sing or play Sa Re Ga Ma to save their lives – yet are immensely active in writing biased critical pieces. Reminds me of what Pt Hariprasad Chaurasia said of these people” They can’t play, they can’t sing, so the only option is to become a fierce critic”. Re: Maihar, Amjad and Shahjahanpur styles, each has some great features worth learning and adopting. With Ud Ali Akbar Khan, it was his mind boggling ability to conjure up a completely new angle to a raga – sheer bliss !. He also was the first person to play the sarod with clear sound (along with Pt RMM) in the alaap with much more emphasis on emotion. This was a revolution from the “dara diri” bashing crowd of yesteryears. Ud Amjad Ali extended the clear sound to all parts of the performance – rather than disintegrate into the “clackety clack” style of the gat, as well as polished the ekhara style of playing, importing Ud Vilayat Khan and Ud Amir Khan’s repertoire. New style of compositions were used, simplicity was preferred over complex dara diri (at least for a while). There is also a lot of extremely good material in the Shahjahanpur style – sort of the middle of both styles. They do not shy away from the upper octave (the bane of every sarodiya’s existence), so in terms of compositional maturity, they have great depth and diversity. And the gharanas are learning from each other. I notice Maihar-ites playing crystal clear gats these days (Alam Khan) and others like Pt. Tejendra NM producing divine music combining the Maihar emphasis on emotion and the Shahjahanpur/Amjad style of gayaki interpretation. The Shahjahanpur-ites are adopting Ud Amjad Ali’s style of clarity, which goes with their wonderful material (e.g Pratyush) – some very good material there. That’s exactly how a craft is honed and progress made – learn from each other and build on the past. Each of the other gharanas has absorbed a vital lesson from Ud Amjad Ali- you need to play clear, pure sound – working yourself into a frenzy doing dara-diri doesn’t count for much if the sound is compromised. 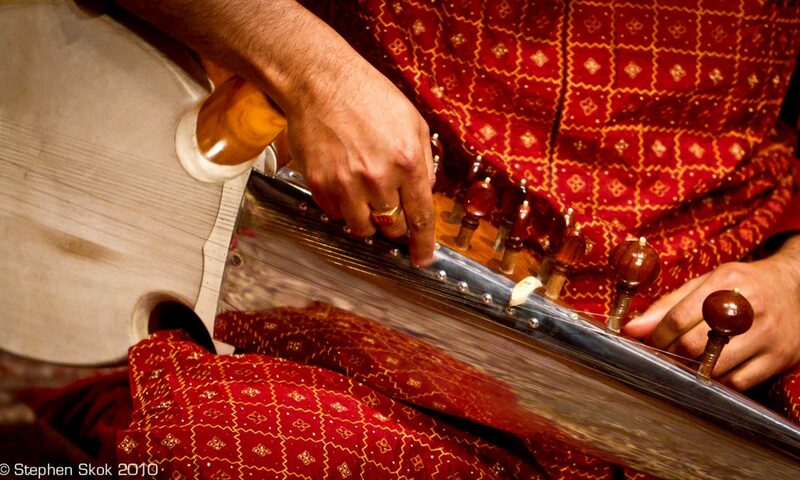 This is Ustadji’s legacy of the sarod – an entire generation of sarodiyas now focus on sound quality. Little people on the sidelines criticising maestros past or present do nothing for the music. While we do not have a pioneer of the calibre of Ud Ali Akbar, Ud Amjad Ali or Pt BDG, the younger performers are full of promise and will mature over time. As they bring more material to an improved style of sound delivery, we’ll have a much better repertoire. One can only hope for the kind of transition which has taken place in sitar (Ud Shahid Parvez et all) to happen in the sarod. I remain hopeful. Saby, I note that comments so far have not even touched on the actual Bhajan here. Anyway, thanks for the soulful rendering of this beautiful Khamaj bhajan, which is well worth rendering on my sitar (whether Karatch OR Ghandar Pancham). Most vocal versions of his gorgeous tune, though sweet, are unfortunately ruined by the Bollywood-style chunk-chunk-chunk formulas. While on the topic of Maiha sarodiyas – it is worth noting how massive has been Vilayat Khan’s influence on sitar musicianship – most young sitarists in India have adopted Gayaki Ang style, even if they are technically linked via gurus to “Maiha Gharana” – this is clear in both tans and meends – I speak eg., of such as Purbayan Chaterjee, Niladri Kumar etc – even the son of Debu Chaudhury, doyen of so-called “asceticism” I have publically witnessed trying to sound like Shaheed Parvez (at an outdoor concert in Kolkata!) Notably, when their gurus are present, they revert to krintans instead of gamaks to signal symbolically their official gharana affiliation. Point I’m making here is also relevant to Maiha sarodiyas who have moved a long way from the style and sound of Ali Akbar Khan and play with more clarity and sharpness. That has to do, I suppose with sarod construction as well, but may point strongly to Amjat’s indirect influence. Amjat is distinctive because his sound shines (that’s my best adjective to convey an aural experience) – and once you have heard it, like Vilayat Khan, their is no turning back to the tinkle tinkle, but contfronting a lifetime of split fingertips and nails – but it’s worth every scratch! On that topic, having just heard a rendition of Ali Akbar Khan playing Manj Khamaj on youtube- I wonder why his sarod sound reminds me of a banjo? Thanks Marc – the sound is paramount for me – everything else is secondary. You are right in that once you’ve heard Ud Amjad Ali, there’s no going back to the “clackety clack” pluck attack type of playing the sarod. His volume control, smooth string changes, clarity and sense of melody remain supreme – none of his disciples come even close. His 5 minute Hamsadhwani is a good example of his mastery of the instrument – I have never heard anyone technically capable of pulling this off – or getting even close. Re: Shahid Parvez – I regard him as the greatest living sitariya of today – while he’s stood on the shoulders of a giant (Ud VK), he has developed his own voice, and is easily the most balanced sitar maestro there is. (exceptional emotional control as well as technical material, beautifully balanced in perfect sound.). I find rhythmic playing (tantrakari) a bit hard to listen to – I cannot close my eyes and absorb the raga if I’m being jerked around in a paroxysm of krintans at every note. The youngsters of today have thankfully picked up some pointers from SP – however, they need to match his content which is a big ask. Purbayan and Niladri are extremely promising and talented, however, have to perform in circus acts to earn a living (which is a crying shame for artistes of their calibre). However, the general calibre of performers of sitar is far better in the next generation compared to sarodiyas, but at least, all of them have clean sound these days. You have some wonderful posts! Is there any way you would be able to post the notes for Vaishnava Janato? This piece brought tears in my eyes. If possible can you please send me the notation of this …vaishanav janato. Enter your email address to subscribe to sarod.com.au and receive notifications of new posts by email.